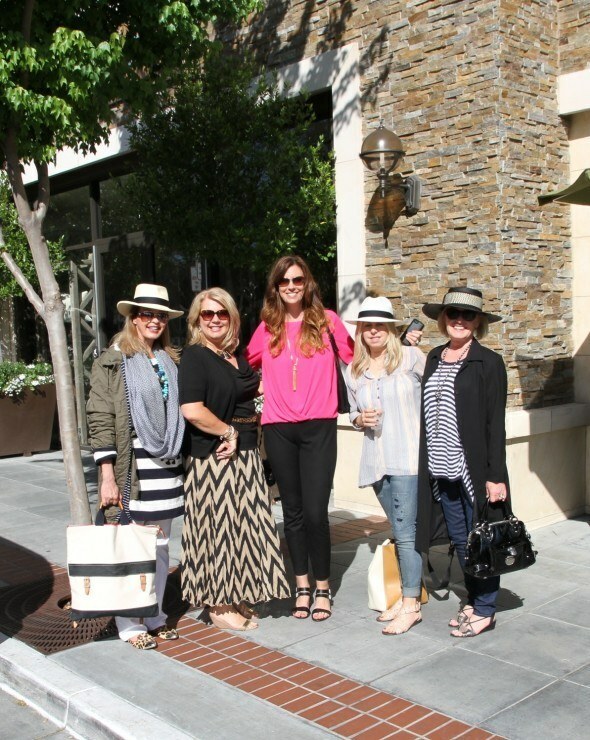 I recently returned from three days in Napa with four other lifestyle bloggers. One of the most important decisions we made while planning our trip was where we would stay. As you would imagine, Napa Valley is chock full of lodging options. 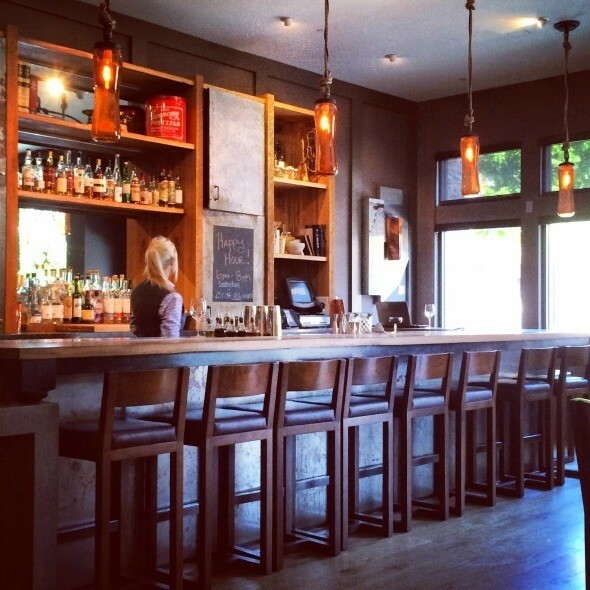 Everything from quaint Victorian bed and breakfasts to budget national chain motels, and high-end, exclusive luxury resorts tucked away in the hills to modern, urban hotels located in the city of Napa. For our group of five women, we wanted the latter. We thought something with a hip vibe, within walking distance of shopping, dining and nightlife, would suit our needs best. We wanted a lively and sophisticated environment but with peaceful, quiet rooms and all the little luxuries one would want while getting away with friends. 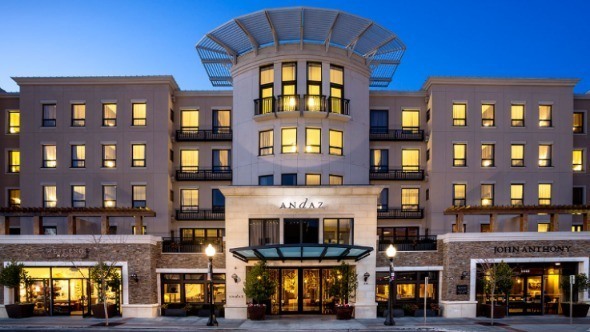 We decided Andaz Napa, Hyatt’s high-end boutique sub-brand located in the newly revitalized downtown Napa area called “West End”, would be ideal for our needs and wants. 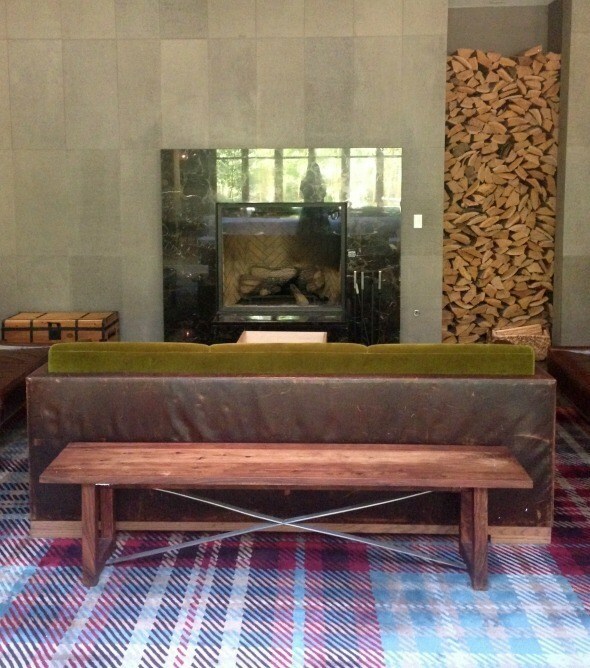 Upon arriving at Andaz Napa, we were greeted warmly and shown to the lobby where we were asked to have a seat while we waited to be checked in. 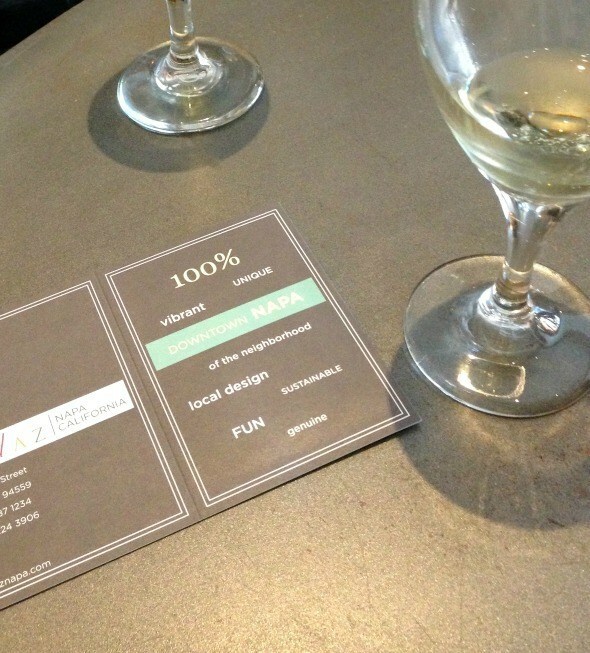 We were offered a glass of Napa Valley wine, which I happily accepted, and were each given our room key and necessary check-in information while enjoying the comforts of their chic lobby. 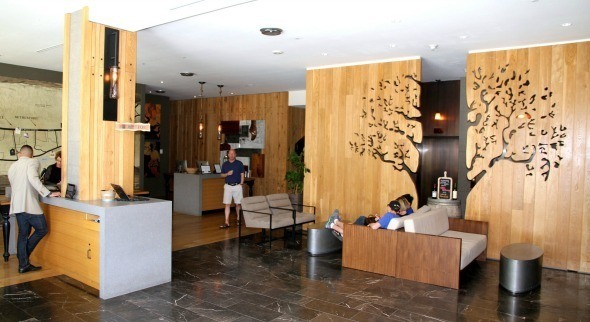 Stylish and modern, the lobby area is comfortable and natural looking, giving it a warm feel. Fresh pressed juices and fresh water enhanced with slices of fresh fruit and vegetables are available and are complimentary, as is a daily afternoon wine reception. Around the back of the lobby is their restaurant, Farmers Table where breakfast is served daily. An inviting sitting area just off the restaurant is ideal for reading the morning paper or browsing the web on your tablet, planning what wineries to visit that day. 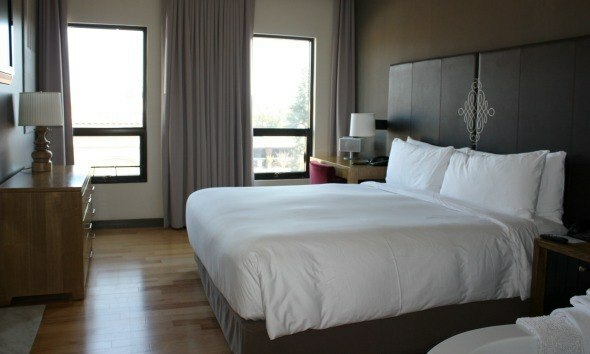 The guest rooms at Andaz Napa are spacious and luxurious. 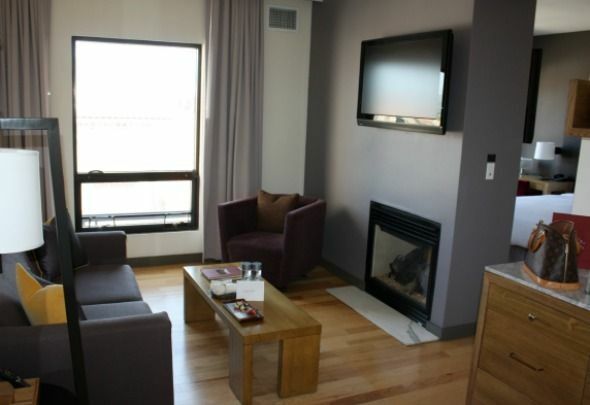 I particularly liked the dual-sided fireplace that I could enjoy from the sitting room or my bed. It added a cozy ambiance to the room. The spacious sitting room is ideal for entertaining a few friends, reading a book, getting some work done or watching a movie from the flat screen television. The bedroom and bathroom are both large and luxurious. The King bed is plush with a fluffy down bedcover and wonderfully soft linens. Once I saw the sleek free-standing tub which sat next to my bed, I could hardly wait to try it out. I spent my mornings sipping coffee and watching the flames flicker in the fireplace. If only every day could begin that way! 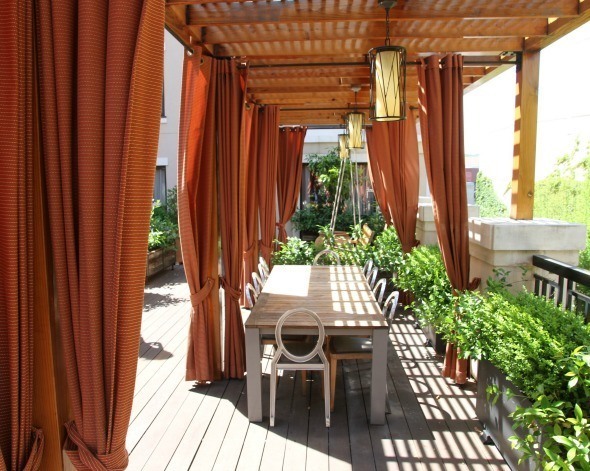 After settling in our rooms and changing for dinner, our group decided to meet up at Andaz’s Mercantile Social, an outdoor bar and restaurant located on the second floor, for drinks and food. 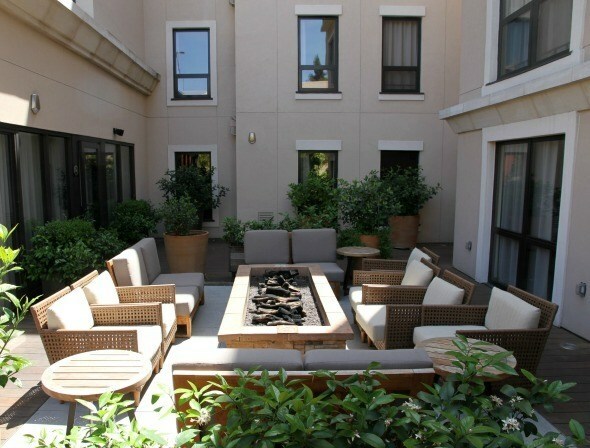 Fire pits, comfortable couches and chairs, drapes and potted plants made for the ideal environment to laugh, talk and relax with my friends after a fun-filled day in Napa Valley. 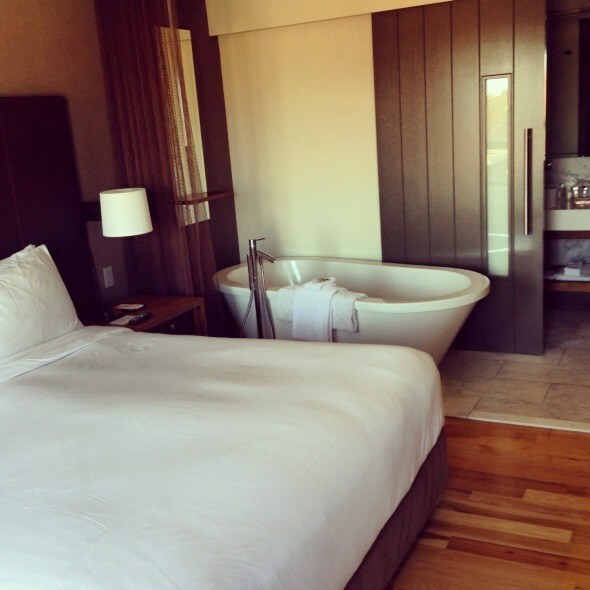 I won’t hesitate to visit Andaz Napa again. With their competitive rates, luxurious rooms, excellent customer service, superb location and hip yet welcoming atmosphere, there is no reason not to! May is the perfect time to visit Napa. 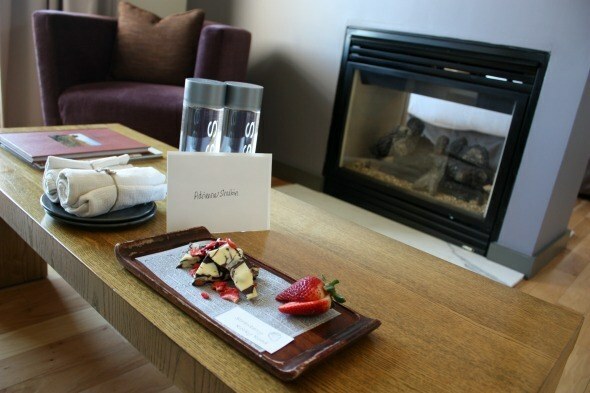 Pamper the woman in your life this Mother’s Day with Andaz Napa’s package called “The Wine Wanderlust”. It’s their premier package and includes a two-night stay in their Vintner Suite, round-trip transportation to the airport, breakfast each day, and personalized wine tour featuring lunch in a winemaker’s home and very exclusive high-end Napa Valley wine tastings. To find out more about Andaz Napa, their Wine Wanderlust package or to book a reservation visit their website or call 707-687-1234. Disclosure: Andaz Napa generously sponsored my lodging for two nights. 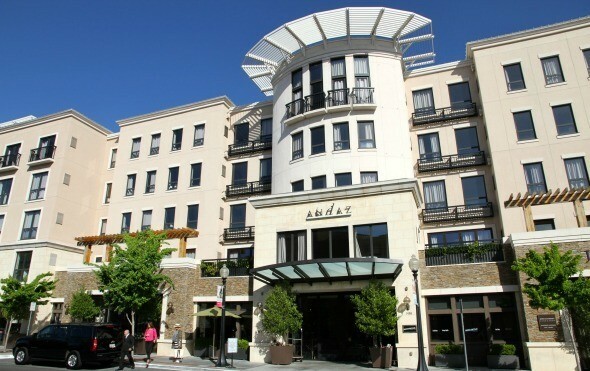 I paid for food, parking and other incidentals while staying at Andaz Napa. All opinions expressed here are my own. I think anyone can live The Rich Life, even on a budget. 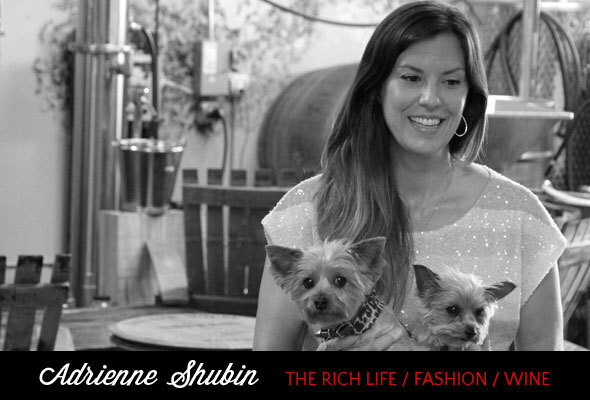 Consider subscribing to once a week emailed subscribe to weekly Skimbaco Lifestyle feed.